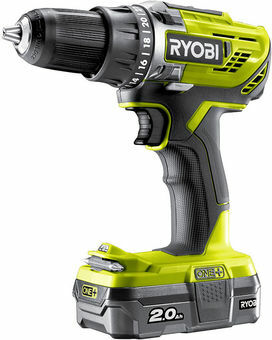 Compact cordless drill Ryobi drill R18DD3-120S is designed for drilling holes and tightening fasteners when assembling furniture, installing various designs, performing repair, construction and finishing works. Lithium-ion technology increases the service life of the device and lets you charge your battery regardless of its degree of discharge. At the base of the tool bit holder is provided, thus, spare rigging at your fingertips.